In 2008, at the height of the recession, The New York Times ran a story about how to throw a “transcendent” holiday party on a stripped-down budget. Reporter Alex Williams contacted David Monn, an elite New York event planner who often puts together five- and six-figure bashes for the Hollywood A-list, and challenged him to plan a dinner party for eight in Williams’ West Village Apartment. His proposed budget for the entire event, including food, wine, and decor, was $30 a head. But if a $240 budget is a still a stretch for your wallet, don’t worry. 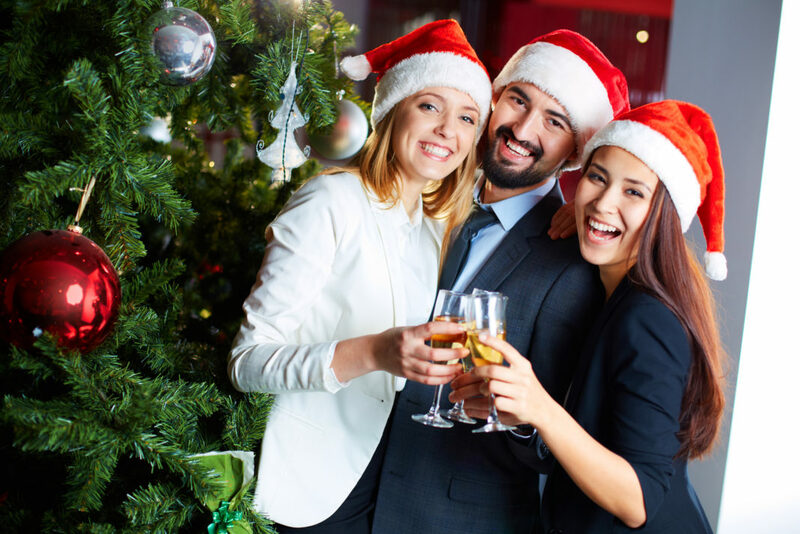 There are plenty of ways to have a great holiday party on a budget even Ebenezer Scrooge would approve. It all comes down to making smart choices about the four basic elements of a party: decorations, food, liquor, and entertainment. Decorations are an important part of any Yuletide event. It’s the evergreens and twinkling lights that really turn a plain old dinner party into a holiday party. Unfortunately, holiday decorations can get expensive – evergreen wreaths and garlands can range in price from $35 to $179 each. Throw in a few extra touches like a $50 pair of silver reindeer or a $30 set of glass bird ornaments, and you could easily burn through hundreds of dollars before you even get any food on the table. So if you want to throw a big party on a small budget, the first thing to do is toss those pricey catalogs aside. Instead, turn to the Internet, which is teeming with ideas about how to create your own Christmas decorations on the cheap. Alex Williams, in the audio accompaniment to the Times article, explains that Monn told him the key to decorating on a budget is to edit: “Pick a really simple theme, and really stick close to that theme.” That way, you can focus your decorating dollars to get the biggest impact. For Williams’ party, Monn chose a “winter wonderland” theme, which combined imagination with practicality. By choosing white for the main color in the decorating scheme, he was able to make decorations out of cheap, everyday items. For instance, he bought a roll of plain white fabric for a tablecloth, and a ream of copy paper to make snowflake decorations. Wrapped Gifts. If you choose this as your theme, you can build your decorating scheme around a roll or two of inexpensive wrapping paper. You can use the same paper in multiple ways: wrapped around empty boxes, framed in inexpensive frames, cut into short strips to make napkin rings, and even as a table runner that you don’t have to wash when the party’s over. You can also cover coffee cans with the paper and trim them with ribbon to make flower vases. Fresh Fruit. Bowls of fresh apples and pears look seasonal and festive, and you can enjoy the fruit for breakfast the next day. You can expand this theme by stringing cranberries to make garlands, scattering the berries around a pillar candle, or propping each guest’s place card against a fresh pear. Christmas Stars. For this theme, you can use anything at all with a star shape. If you don’t have a lot of star-themed decorations, it’s easy to make your own by painting or stamping a star shape onto anything from newsprint to burlap. Once you settle on a theme, you need to put together some decorations that fit in with it. You can find tons of articles online about ways to make DIY decorations for the holidays. Borrow From Nature. If you live in or near a wooded area, you can gather your own materials outdoors for free. Go for a walk with a big paper bag and scavenge pine cones, acorns, red berries, and fallen evergreen boughs from the ground. You can arrange these in baskets, bowls, or flower pots to make elegant, natural-looking decorations for your holiday table. If you don’t live near the woods, you can still pick up evergreens cheap by asking the Christmas tree vendors if they have any trimmed-off branches to get rid of. Some vendors sell big bunches of trimmings for a dollar or two, and others are happy to let you take all you can carry for free. Make Your Own Snowflakes. The paper snowflakes you made in elementary school can make great decorations for an adult party – dust them with glitter to add extra sparkle. For this project, all you need is a pair of scissors and a $5 bundle of copy paper. Do It With Doilies. White paper doilies, which resemble snowflakes, can fit beautifully into a winter decorating scheme. Large ones can serve as place mats, and small ones can be used as place cards. Just print out each guest’s name on a piece of paper, cut out a circle surrounding the name, and glue it to the doily. You can buy a packet of 32 paper doilies for about $2 at a party store. Use Candles. Even a plain meal feels elegant when eaten by candlelight – especially since the softer lighting kindly conceals peeling paint and faded rugs. Tea lights are a great choice – a big bag of them costs only $10, and they can be used in dozens of ways. You can set them out in glasses along the mantelpiece, arrange them in clusters on a mirror with some fresh herbs and berries, or float them in a glass bowl full of water. Just make sure to keep them well clear of any loose fabric and other materials that could catch fire. There’s really no good way to serve an elegant meal on paper plates. Eating off real dishes with real cloth napkins – or better yet, fine china and linen – adds a touch of class, even if the menu itself is simple. Unfortunately, not everyone has a good set of dishes, or at least not enough for a large gathering. However, if you don’t have nice dishes and table linens of your own, you probably know someone who could loan them to you. As long as you’re careful not to break any dishes, and scrupulous about replacing them if you do, there’s no reason to feel bashful about asking to borrow tableware from a friend or family member. If they’re just sitting in a closet anyway, your friend may be happy to see them put to good use. Festive decorations can turn your humble home into a feast for the eyes – but don’t forget about the ears and the nose too. Sounds and smells can be a key part of creating a holiday mood. In fact, they’re likely to be the first things your guests notice when they walk in the door, even before they have a chance to take in the scenery. Fortunately, appealing to these senses doesn’t have to be pricey. You can engage your guests’ sense of smell with anything from a $10 scented candle to a $1 bunch of fresh-cut evergreen boughs. If you’re cooking as your guests arrive, you can beckon them across the doorstep with the aroma of baking cookies or spiced cider. Or, if the meal is already made, you can make a “stove simmer” – a pot of simmering water with some citrus slices, fresh herbs, or cinnamon sticks – to fill your home with holiday fragrance. Appealing to the ears is just as easy. All you have to do is put on some seasonal background music. Depending on your tastes, this can be anything from Handel’s “Messiah” to “Elvis’ Christmas Album.” If you don’t have any holiday albums in your collection, you can borrow one from your local library. No party is complete without some kind of food and drink. However, a meal doesn’t have to be fancy to be festive – in fact, it doesn’t even have to be a full meal. Limit Your Guest List. When planning your guest list, focus on the people you really want to spend time with. This is especially important if you’re hosting a dinner party, since an intimate dinner for six is a lot easier to coordinate than a buffet dinner for 30. Also, by keeping the guest list to a reasonable size, you can spend some quality time with each of your guests, rather than having to circulate. Go Meatless. Since meat is the priciest ingredient in most meals, serving an elegant vegetarian dish is a great way to control your costs. Search holiday vegetarian recipes online for suggestions. Use a Slow Cooker. If you’re not prepared to leave out the meat entirely, you can stretch your meat budget by using a slow cooker, such as a Crock-Pot. The low, moist heat a slow cooker provides is great for tenderizing tougher cuts of meat, which also tend to be cheaper. Slow cookers are also good for preparing soups and stews, which make a small amount of meat go a long way. Make it a Potluck. As the old saying goes, “Many hands make work light,” and that includes the work – and the cost – of hosting a party. One of the easiest ways to cut both the budget and the workload for a holiday party is to make it a potluck, for which each guest brings one dish. If you don’t want to make the whole meal a potluck, you can tell your friends who ask “What can I bring?” to contribute a batch of their favorite holiday cookies. That takes the burden of preparing dessert out of your hands and gives you a nice variety of cookies to sample. Choose a Midday Meal. Serving a holiday lunch or brunch lets you fill your guests up with satisfying but inexpensive fare like sandwiches, pancakes, muffins, and fruit salad. Another alternative is to throw a mid-afternoon party with finger foods, such as cookies, veggies or crackers with dip, and mini-sandwiches. A midday meal is usually cheaper than a dinner, and as a bonus, it’s often easier to fit into your guests’ crowded December schedules. Just Have Desserts. Dessert is everyone’s favorite part of the meal, so why not just skip straight to it? When you’re serving just holiday dessert instead of a full meal, you can go all out on something fancy like a chocolate fountain – or keep it homey and cozy with cocoa and trays of holiday cookies. You can even make an activity out of preparing the desserts, such as decorating gingerbread men or making your own sundaes. For many people, holiday spirits don’t just mean good cheer, they also mean beer, wine, and liquor. However, good liquor can be costly, and when you’re having a large gathering, the cost adds up quickly. If you follow the traditional rule of providing one bottle of wine for every three guests, then a gathering for 15 people would require five bottles – so even a modest $20 vintage would add up to $100. Stick to One Cocktail. Having a fully stocked bar for your party is not only pricey, it could mean spending more time mixing different drinks than socializing with your guests. Instead, try serving just one festive, seasonal cocktail. Midwest Living suggests the Red Apple Crisp, a concoction of rum, red apple liqueur, cranberry juice, and club soda that should only set you back $22 for a dozen guests. Other traditional holiday tipples include eggnog, mulled wine, and hot rum punch. Choose Inexpensive Wines. Although good wine can be expensive, there are plenty of decent wines out there at budget prices. Perhaps the best known is the Charles Shaw wine sold at Trader Joe’s, known as “Three-Buck Chuck” for its ultra-low price tag. Food & Wine also recommends several good wine choices at under $15 per bottle. Another option is to use cheap wine to make mulled wine, which is sweet spiced red wine served hot in a mug. A jar of milling spices – allspice, cinnamon, and orange peel – should set you back between $5 and $10. BYOB. Instead of serving a potluck meal where every guest brings a dish, prepare the meal yourself and invite every guest to bring a bottle of wine to share. This gives you a variety of different vintages to sample, and tasting and talking about the various wines makes a good conversation starter. Buy in Bulk. If you’re having a large gathering, you can cut your liquor costs by buying in bulk. For instance, wine blogs estimate that buying wine by the case rather than as individual bottles saves you about 10% of the cost. Boxed wines are often still cheaper. Epicurious reports that a three-liter box of wine (equivalent to about four bottles) costs around $30 and is surprisingly good. Beer, on the other hand, is often pricier in kegs than in bottles or cans, so be sure to do the math before you buy. Go Alcohol-Free. Although booze is traditional for a holiday party, it isn’t essential. An alcohol-free party can be just as festive, and it’s also more family-friendly, since people of any age can enjoy everything you serve. Plus, having a dry gathering means you don’t have to keep an eye on your guests to make sure it’s safe for them to drive home. At many parties, the main activity is conversation, which doesn’t cost a cent. However, if you find mingling and chatting with strangers to be dull – or if you’re afraid your guests might – you can liven things up by providing some form of entertainment. For a great family-friendly party, invite friends over to watch a classic holiday film. If you don’t have any in your collection, you can rent one from Redbox, stream it on Netflix, or check it out of the library. Another option is to invite guests to bring their favorite holiday movies to the party and then vote on which one to watch. If you’re short on seating, pile some pillows on the floor, and have lots of blankets for snuggling. Accompany the film with big bowls of popcorn and a cozy drink, such as hot cocoa or eggnog. Games have long been a traditional part of holiday parties. In Charles Dickens’ classic story “A Christmas Carol,” Scrooge’s nephew and his friends spend their after-dinner hours playing party games, including forfeits, blind-man’s buff, and Yes and No, a Victorian version of Twenty Questions. Pictionary. In this board game, players pull cards and try to sketch a quick picture of whatever the card shows. Their goal is to get their teammates to guess the word before time runs out. Since this is a team game, you can play with as many players as you like. Apples to Apples. In this classic party game, one player pulls a card with an adjective on it, such as “creepy.” Then the other players choose cards from their hands with nouns that they think fit that adjective, such as “spiders” or “dandruff.” The judge picks the best submission, and whichever player put it in wins that round. This game works for a group of any size. Charades. All you need to play this game is pencils, slips of paper, and a hat or other container. All the players write down quotations and titles from movies, books, and songs and put them in the hat. Then they take turns drawing a slip out of the hat and trying to act out what it says without speaking. You don’t even have to keep score. The point is just to be as amusing as possible. Celebrity. The technique of Celebrity is similar to Charades: Write down the names of celebrities, put them in a hat, then take turns pulling them out and trying to get your teammates to guess them. The main difference is that in Celebrity, you’re allowed to talk, as long as you don’t say the celebrity’s name. Fictionary. For this pencil-and-paper game, you take turns choosing an obscure word out of the dictionary. After making sure no one knows the word, you write down its real definition, while other players write down their own made-up definitions. Then you mix up all the definitions and read them out, and all players vote on which they think is the real one. Each player gets one point for guessing correctly and 1 point for each other player who falls for their fake definition. When I was a kid, our neighbors held a Christmas-caroling party every year. We would meet at their house and then set out on a trip around the block to sing carols to all the neighbors who were home. After finishing the rounds, we’d head back to the house for mulled wine, hot cider, and cookies. This party was always my favorite event of the holiday season, and to this day, I don’t know if I’ve ever been to any holiday party I enjoyed more. To reproduce it in your neighborhood, all you need is a group of friends, some traditional Christmas carols (on sheet music or memorized), and warm clothing. One good tip is to stop only at the houses where people have Christmas decorations up, so you don’t accidentally offend people who don’t celebrate the holiday. A tree-trimming party, where people gather to decorate the Christmas tree, is a classic holiday event. One nice thing about this type of party is that you don’t have to do a lot of decorating ahead of time, since that’s the main activity. However, you should spend some time sorting out all your ornaments and getting them organized so people can easily find what they want. Set up the tree in its base, putting it in the middle of the room so people can reach it from every side. If you’re planning to hang lights, you should probably do these ahead of time, since it’s a complicated job that gets more complicated with a lot of people involved. Then set out your boxes of ornaments in various spots around the room, so there’s always something within easy reach. You can put on some holiday music in the background to add to the festivity, or even sing carols as you work. The best food choice for this type of party is finger food, since sitting down to eat takes guests away from the action. With drinks and munchies, your guests can stop for a quick bite in between ornaments. Quilting Bee. Quilts for Kids is an organization that provides quilts for seriously ill children. For just $6 to cover shipping costs, they send you a kit that includes fabric and a pattern, so all you have to supply is the batting and the labor. When your quilt is done, you mail it or bring it in to your local chapter, and they pass it on to a hospital or a shelter. If you have friends who love to quilt, this is a great way to have fun and help others at the same time. Food Drive Dinner Party. Invite friends for a dinner that gives back to others. Ask each guest to bring a few nonperishable food items, such as a can of beans or a box of spaghetti, to donate to a local food bank. After you enjoy your own holiday meal, you can all bag up the food and take it down to the food bank together. Holiday Toy Drive. Instead of swapping presents with your guests, you can all give gifts to families in need. Invite each guest to bring a wrapped, new toy to donate to an organization such as Toys for Tots. To add to the sense of festivity, pile your presents under the tree and take a picture before you carry them to the donation site. Volunteer as a Group. Get a group of people together to volunteer at a local charity such as a soup kitchen or an animal shelter. You can find volunteer opportunities in your area through VolunteerMatch.org. Make this a prelude to your holiday party or the main event. There are lots of different ways to combine these four elements to put together a great holiday event on a budget. The best way to plan your party is to work backward. Start by figuring out what you want the main activity to be, and then choose decorations, food, and drink to go with it. For instance, if you want conversation to be the main event, then a sit-down dinner is a great way to get people together within talking distance. On the other hand, if what you really want is music and dancing, then you’re better off with finger foods that won’t get in the way – as well as decorations that won’t get knocked over easily. The right food, drinks, and decorations all help set the mood for a holiday party – but in the end, they’re not what matters. After all, what guests are going to remember after they go home isn’t the food they ate or the way the house looked. Instead, they’ll recall harmonizing with the old carols on the stereo, or laughing hysterically at someone trying to act out “Grandma Got Run Over By a Reindeer” in Charades. When you get right down to it, the real point of any holiday gathering is to have fun and spend time with the people you care about. Spending more money can make your party look more impressive, but it’s the people that really make it an event to remember. In fact, the parties thrown on a shoestring budget can be the most memorable ones, because they strip away all the window dressing and put the focus on friends, family, and fun.